But you can't find it online anymore, just some of the responses to it and, thankfully, a screen-cap made by one of Ezra's avid fans. And so 2015 begins as 2014 ended, with Ezra in trouble. You mean you honestly don't find the police's original tweet to be just the faintest bit Orwellian? 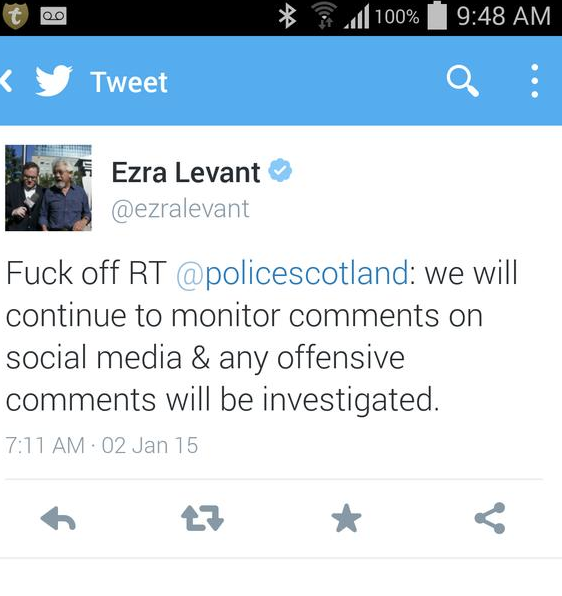 We may agree that Scottish law here is flawed while acknowledging that Ezra Levant is a fucked up douchebag. Do any of you know what Scottish law is on this subject? No Dana, I do not know what Scottish law is on this subject. Perhaps you can fill us in on the intricacies of the Prevention of Rudeness by Right-Wing Bloggers in Other Countries Act. It is as a result of the utterings of a rather tired looking, English, Ann Coulter wanna-be. The police received complaints and had to investigate to determine if a criminal offence had occurred. That's kind of their job. So the "my racist speech is free speech" and "you mean this isn't America?" crowd are all up in arms about it. She. like Ezra, wouldn't be even noticeable if it wasn't for how thoroughly unpleasant and sad they are. The police will probably come back and say "nothing criminal happened" and that will be that. But unlike here where accusations of criminality against the PM are largely ignored by the RCMP, the Scottish Police seem to be actually doing their job.